OK this is the real deal super yum-yum candy cake cannabis. The kind you just sniff over and over again like a bouquet. The herb that you roll up and dry hit the joint before lighting it because the air you pull through tastes like a grape candy straw. You might catch yourself staring deeply into the crenelated lavender folds of the nug itself as the light glints off the ample crystals nestled between the green and purple calyx. Few flowers have this ubiquitously high grades on smell, taste and look as this wonderfully crafted GDP from Fun Uncle Farms. Now let’s delve into the effect factor. Mind you, this must be perceived through the perspective that I am an above average cannabis imbiber and, as such, my THC tolerances are far above the norm. That being said, this medicine is straight up FIRE. I smoked a bong rip after working in the offices and then commuting home, so for me, my THC levels were lower than normal. After opening up the cool purple packaging (which was really annoying to open, but hey child-safety first!) I drew it right up to my nose and then kept my nose in there for a moment like a horse with a feed-bag on. Almost instantly I registered that it was clean and unladen with the petroleum-based chemicals so often found in (even “organic”) cannabis. I could only stand it so long before I tore a smallish chunk off the dense-yet-squishy flower and crammed it into the glass bong. For the first few minutes after I exhaled, I felt like I had my sunglasses on my head or my headphones on. I kept reaching up to take them off only to find there was only hair up there… Suffice it to say this flower, in spite of listing out at 15.84% THC, is strong. As much as we wish to codify cannabis using numbers, in my experience of growing over 200 strains, the effect of cannabis is not always accurately represented by the THC percentage. So make no mistake, for me at least, this flower is potent. The effect was very heady for an indica, though perhaps that is because I am sitting here writing at a computer instead of running through the forest or playing ultimate frisbee. I feel light and energized and creative. We adore you for reading this and for using Foggy Daze as your cannabis delivery service. We pride ourselves on not just delivering cannabis products to your door, but Good Vibes as well! 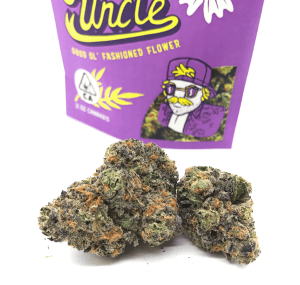 If you like yummy flowers, and you like strong flowers, and you like pretty flowers, then I wholeheartedly suggest you try this GDP from Fun Uncle. :There’s only one original and unequivocally… this is it! There are lots of imitators out there today, but this proprietary “Royal Indica” strain whose puffy buds are unusually dense, magnificent in their unreal color scheme, their unmistakable smell, awesome taste and unbelievable potency are what make it, straight up uniquely… the “Real Deal!